Mad Hatters Teapot: It’s a Miracle! It’s a Miracle! If this can happen then ANYTHING IS POSSIBLE! Did I see the Holy Virgin in my oatmeal? Did I win at Power Ball? So what is so miraculous? My Bougainvillea has Blooms on it!! BFD, you say, Oh No, my Friend this really IS a Miracle! You see, five years ago, I gave my Mom a large potted Bougainvillea for her Birthday. While you Floridians have them growing crazy in your backyards, this is not the case in the Northern states. We are lucky to have them grace our decks and porches for a few months. Anyway, at the end of the season, my Mom split the Bougainvillea and gave me one half. I would water, feed and care for this lovely tropical beauty, but my little lovely refused to bloom again! I never gave up. I moved it from location to location, and window to window. I tried varying the amount of water and I tried different fertilizers, but still no blooms. I went down to feed my cats and out of the corner of my eye, I see something pale on the plant. I thought, OH No I forgot to water it and the leaves are dying off! But no, wait! What is that? So I put on my glasses and Behold! It’s a Miracle, A MIRACLE I say! My poor little Bougainvillea was blooming! OK so it’s only one small branch, but nonetheless it still blooms! I kept at it. I KNEW that the blooms on this plant were not only possible, but when achieved, were just Stunning! When something wasn’t working I changed one thing until I found the right combination of Light, Water and Fertilizer. 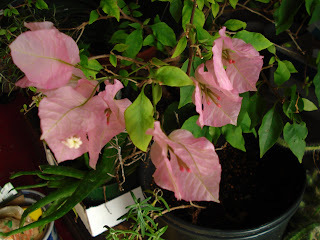 If I can get blooms from that plant, I believe that Anything Is Possible and I if I can get this old Bougainvillea to bloom again then I can do ANYTHING! Finding the right combination to your marketing mix is no different than getting a tropical plant to bloom in Pittsburgh, PA. When something doesn’t work, then changed one thing until you find the right combination. History has proven over and over that Great Marketing Will Produce Great Results. This economic downturn is NOT the time to cut back on Marketing, but rather, you should step it up and become more focused and targeted. Referrals are the least expensive way to grow your business. Referral Gurus, Michelle Donovan, David Frey and Bob Burg, all agree, that your existing clients are easiest and least expensive to sell to, plus they are the best source of new referral business. A great place to start gathering more information on Referral Marketing is: www.MadHattersTeapot.com. I have found some awesome resources and tools to maximize your results with minimum investments of time and money. Growing your business in this downturn is possible - If you are Tenacious and Creative! Come see what’s brewing at the MadHatters Teapot!